So, a week or so ago, I'm sitting at home, minding my own business, reading some blogs, when Steph mentions she got some new needles. I thought to myself 'hmm, maybe I would like to try those' and moved along. So then a few days later, I'm reading some blogs again and Sheri mentions that The Loopy Ewe is now carrying the very needles I saw on Steph's blog days before. Well, you can imagine what happened next. 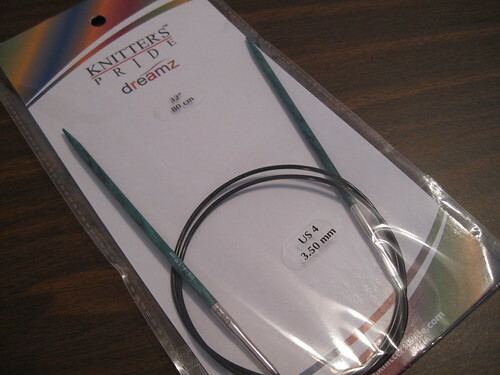 A couple days later I had my knew Knitter's Pride Dreamz needles in my hands. I just got one circular (for now). I got my favorite size: a 32" US Size 4. I almost always knit shawls on a US Size 4 and I already had a new design on the needles with one, so of course I had to switch the needles out to try my new one. The verdict? I LOVE it! They are very similar to the Knit Picks needles, and I have heard that they are made by the same manufacturer. 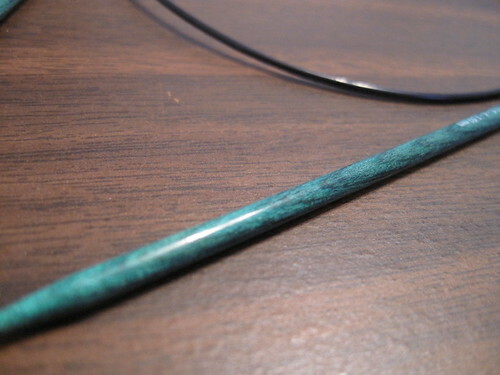 I love love love the color of the wood needle. Each size is a different color which totally makes me want to collect one in every size! So pretty. I definitely see more of these entering the needle stash in the near future.